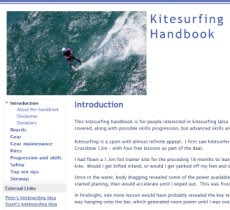 Here is a list of kitesurfing skills I have practised, in rough chronological order. What do you recommend to avoid going right being a natural as opposed to a goofy footer? For some reason (and I think I need to simply hold my back foot - back! ), when ever I try and water start to my right (goofy), my back foot (left foot) wants to switch and become my front foot (turning from goofy stance to natural stance, as that is my "natural" position). This means I end up with the kite powered over my left shoulder and almost behind my back! At Cairns last week, I went to the cable ski park and tried to ride goofy foot, but it was virtually impossible. I always wanted to ride natural stance and was very relaxed and comfortable. As soon as I tried to start at the ski park on my goofy position, I lose it. Any tips on this or ways to practice goofy foot? It is really just practice. Its normal for one direction (goofy) to be much more difficult to learn than the direction where you have natural stance. 1. Keep practicing both directions - eventually you will get your "goofy stance" direction sorted. 2. Ride toe-side in what would be your "goofy stance" direction so that you maintain natural stance. However, riding toeside is a 2nd level skill so this is likely to be harder than it sounds. 3. Practice both stances on a skateboard - this will help you get the feel for turning and board control in your goofy stance.